It may be more central to America’s self image than the notion of “American Exceptionalism” itself: nothing succeeds more than excess. Of course, when you go to a dinner called the “Heavenly Hog Fall Pig Out” restraint is one item that is not likely to be found on the menu. And, true to form — and gloriously so — it was not. At its best the Heavenly Hog Fall Pig Out at Chef Daniel Barron’s Blush Ice Bar + East-West Kitchen was, indeed, exceptional. It was never less than delicious. The overall quality was high and the tone was uniformly adventurous. 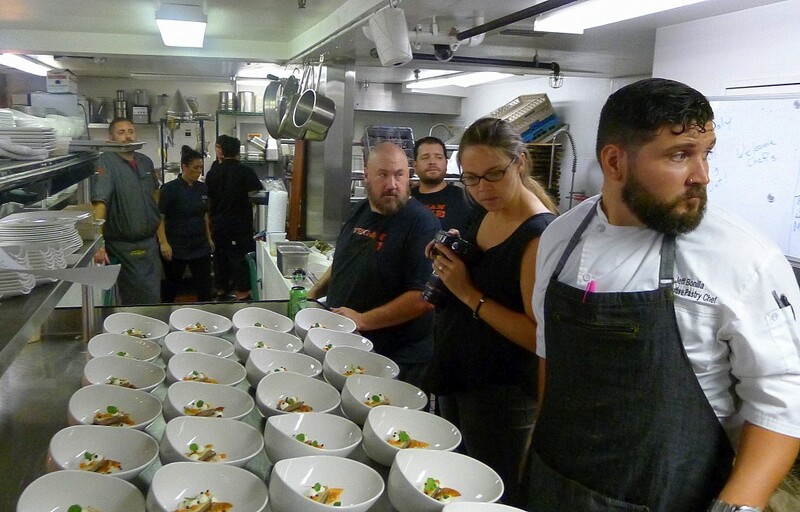 Chefs are competitive types and that might be an understatement. The professional kitchen is very intentionally modeled on the units of the armed forces and just as professional sports is highly modeled warfare. The locker room mentality is nothing foreign to anyone who’s had a cup of coffee in a restaurant kitchen. 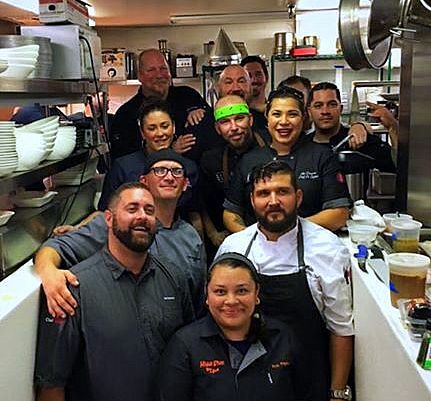 So when you get a ten chefs together to present ten dishes, one each, there can be no surprise that they will do anything and everything they can to outdo one another. And the draw did not exactly help. One pig – from the superb Cooks Pig Ranch – with each chef drawing at random to determine which part of the pig they got. The individual chef’s degrees of pleasure with the picks, like your mileage, varied. The marathon began like a sprint with Hanis Cavin’s dish of ham shank with squash bisque, crispy ham marrow risotto cake, juniper smoked shank, pickled pear, mache and spiced ham oil. It would be very difficult not to consider the dish to be one of “the competition’s” winners. It was, of course, not a competition and there were, of course, no winners. But of course there were on both counts. 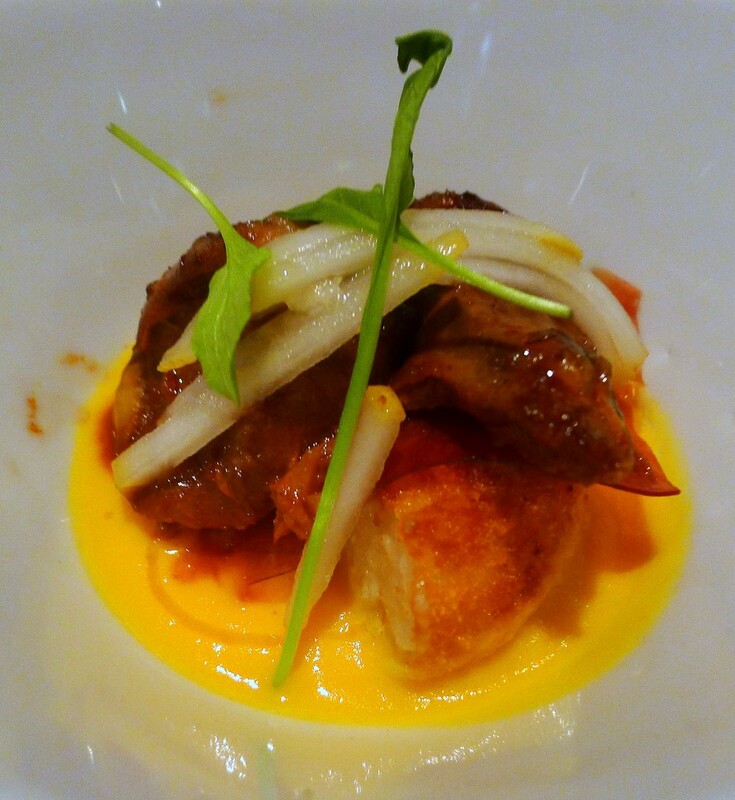 Cavin’s dish hit all the beats: smoky, rich, and savory with just a bit of sweetness in the bisque it nailed the flavor profile. 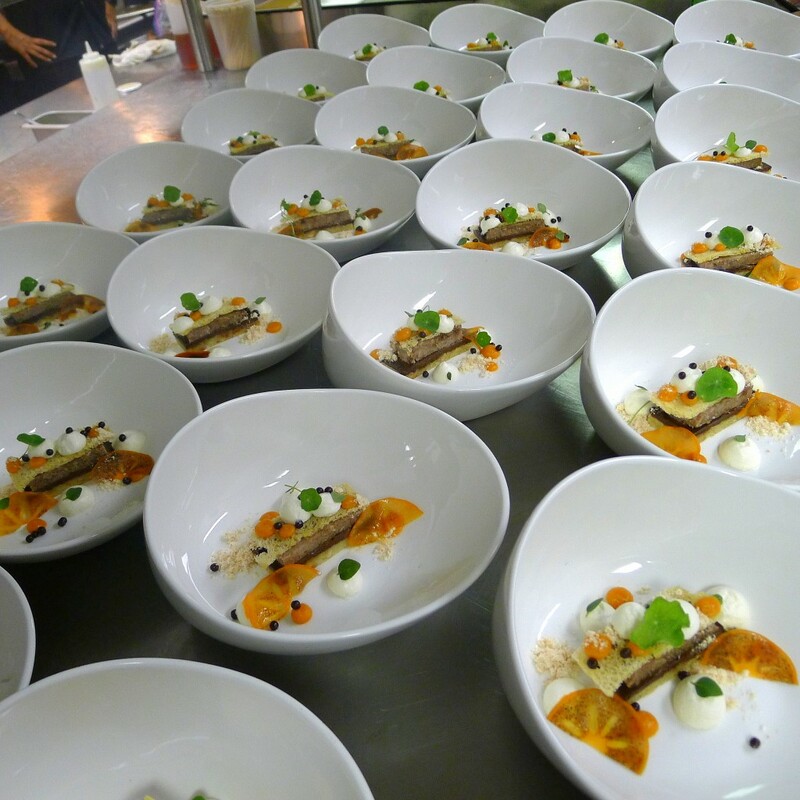 Perhaps the most gorgeously plated – and creative – dish on the evening was Mikel Anthony’s pork loin with five Spice “Horchata,” charred green apple Romesco, Marcona almond gremolata, fennel and pickled mustard seeds. Beyond the beautiful plating the punches of flavor from the pickled mustard seeds and the Romesco perfectly framed the star of the dish: the pork loin. You’d think the chef that got “stuck” with the pig ears would have been the big loser in the draw. You’d be wrong. In the seemingly bizarre logic of Chefo-BizarroWorld getting an ingredient like pig ears may be the coolest draw of all. 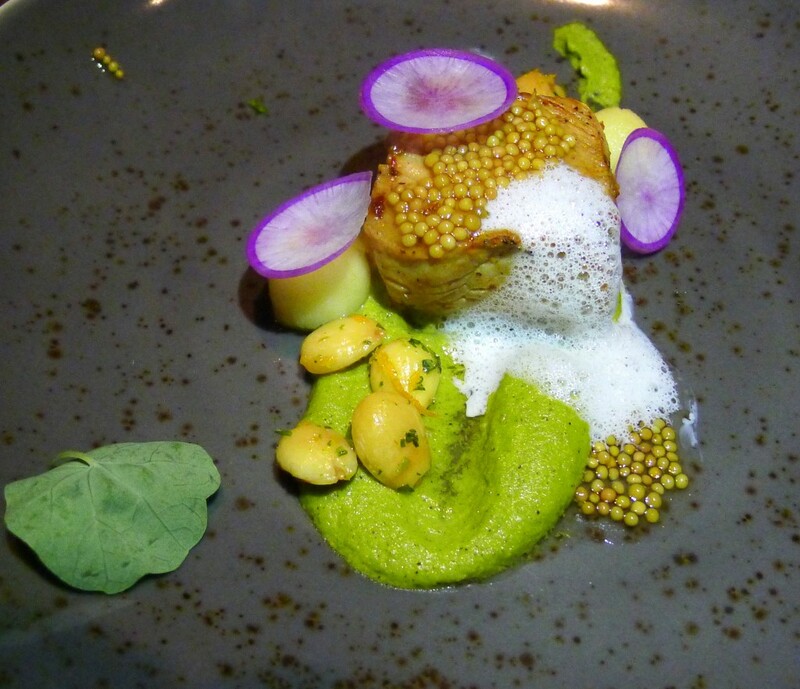 And Ami Cisneros – chef de cuisine at Blush– nailed it with a combination of creativity, technique and a wonderland of texture. 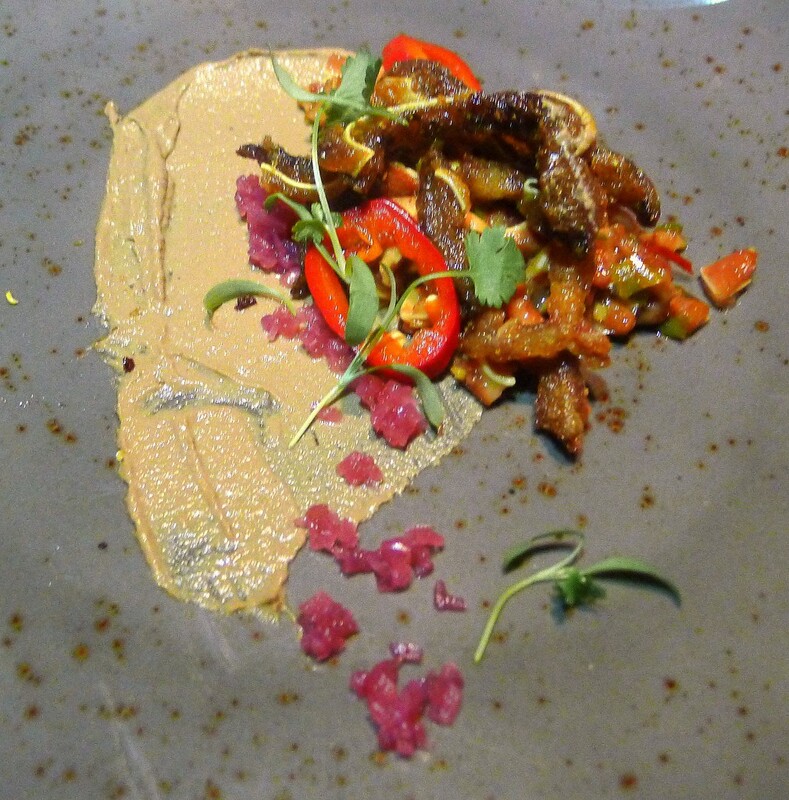 The pig ears two ways – one crunchy, one supple – was a nice etude, but it was the pig liver terrine sauce that spanked the luxury button. 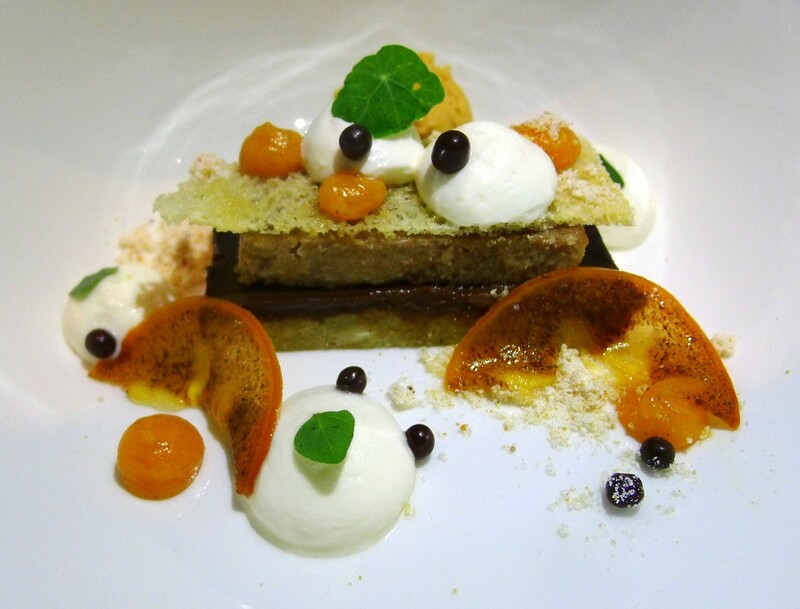 If you have the opportunity to taste the essence of what a high-end restaurant chef has to offer – his or her tasting menu – what you get are a large number of small dishes that are carefully calibrated to work, one with the other, yielding a satisfying experience that has some chance not to totally overwhelm you. The defining factor of these multi-chef diners is different: without the coordination and (chance for) restraint of a single chef organizing the culinary experience the competitive instincts of the chefs dominate. And that is both the success and the excess of it. And I will be back.